"A great tasting cake, and really easy to make!" 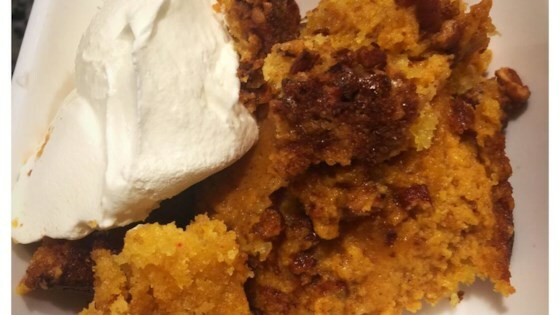 In a large bowl, combine pumpkin, evaporated milk, eggs, sugar, pumpkin pie spice, and salt. Mix well, and spread into the prepared pan. Sprinkle cake mix over the top of the pumpkin mixture, and pat down. Sprinkle chopped pecans evenly over the cake mix, then drizzle with melted margarine. Bake for 60 to 80 minutes, or until done. Top with whipped topping when ready to serve.